The S&P 500 climbed higher by 2.16% during May and my net worth followed suit thanks to the markets, dividends and most importantly savings. During May my net worth increased $12,745.02. 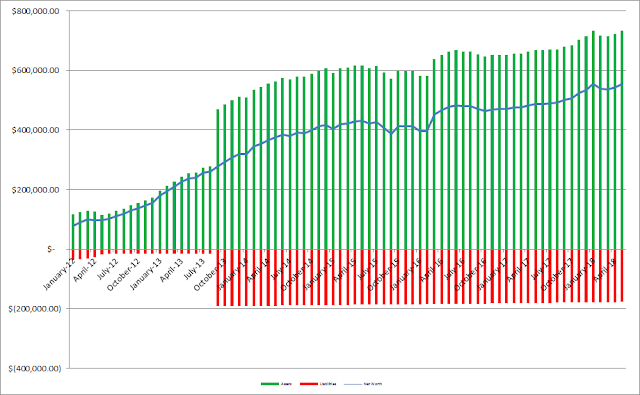 The last two months of Q1 were a pretty big drag on my net worth; however, Q2 has seen it come roaring back. We're officially back into streak mode of positive net worth changes. For the month my net worth increased 2.35% and thus far in 2018 my net worth has climbed 3.93%. 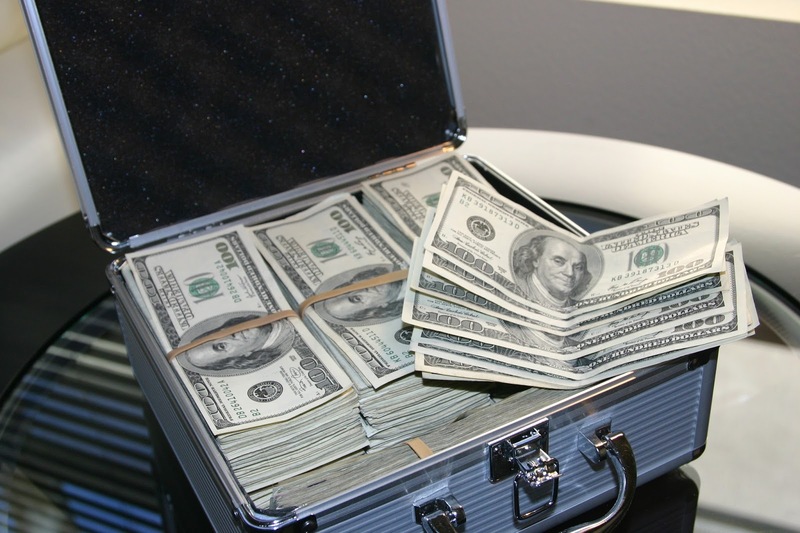 At this time it doesn't make much sense to pay extra on the mortgage given our relatively low interest rate as well as the tax break on mortgage payments and think we'll come out much further ahead investing the extra cash flow. Actually I'm considering trying to do a refi sometime during Q2 or Q3 but time will tell on that since interest rates are moving higher. So the liabilities side of the net worth equation will be slow moving. However, once the FI portfolio is able to get to a self-sustaining level of dividends then the plan is to aggressively pay down the mortgage. As of the end of May we have 26.3% equity in our house based on our purchase price from 2013. However, according to Zillow our house has increased in value around $40.6k from our purchase price which is a nice bonus, although I keep the purchase price as the value in the net worth equations. Based on Zillow's estimate the equity in our house jumps to 37.8%. Since I write so much (or at least try to) about investigating companies as an investment I figured it'd be fun to see how our balance sheet looks. 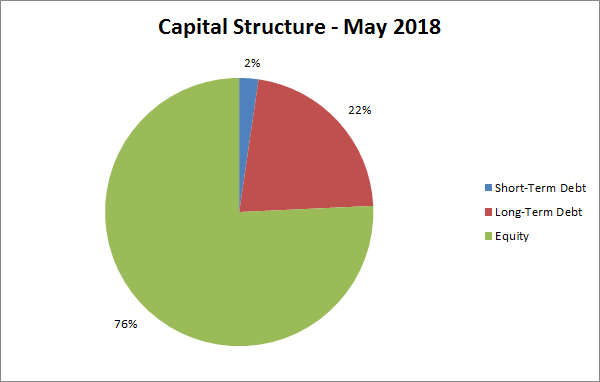 As of the end of May our debt to equity ratio is 32% and our debt to total capitalization is 24%. Not bad, but I'd love to get that debt down to ZERO! 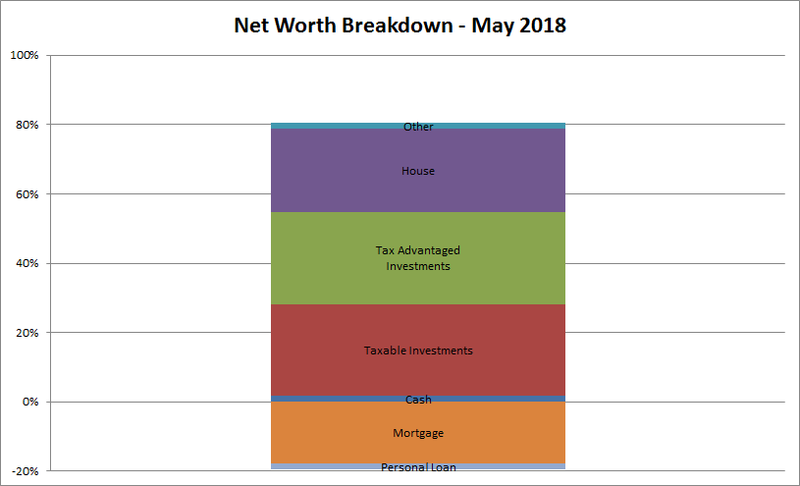 How did your net worth fair in May?